Multiple Spindle Heads Archives | Hypneumat, Inc. This Commander 8-12 Series Drill Head is powered by a Hypneumat M Series 3.5″ Stroke Drilling Unit. 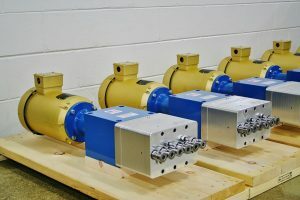 This project utilizes multiple 12 spindle fixed position plates that can be swapped out during job changeover for different hole patterns. 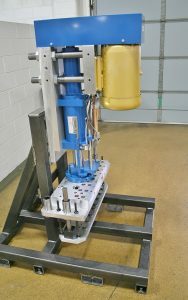 This drilling system consists of a Hypneumat DQ58 Pneumatic Feed Unit and 16 Spindle Drill Head. 1,650 pounds of thrust, 7.5 HP motor at 2,000 rpm spindle speed, ER16 collet spindles, and spring loaded drill bushing plate. Hypneumat just completed over a dozen 6 spindle drilling heads. These robust fixed spindle gear driven heads have (6) ER16 collet spindles set at 1.5″ centers. Above are 3 Commander 500 series 2-spindle heads, powered by 2 Hypneumat LS350E lead screw tapping units and a Hypneumat M200EHB drilling unit. 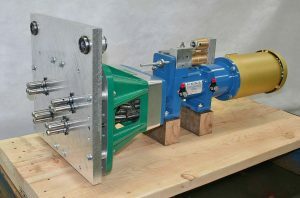 All three units are equipped with a 1 HP motor (1,200 rpm for the tappers and 1,800 rpm for the driller). 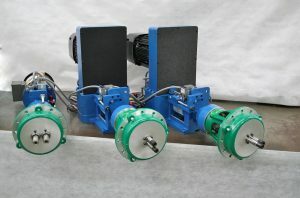 These drilling and tapping heads are setup with fixed spindle plates.